In Haidarnagar market in Palamu district in Jharkhand, an area with a significant presence of Maoists, the roads are lined with red flags with images of Hanuman stitched over them. At the crossroad in the market, Bhojpuri songs blare out of loudspeakers kept in a mini truck. These are also used to announce that Kameshwar Baitha, the sitting Member of Parliament from Palamu will be holding a nukkad sabha. In 2009, Mr. Baitha, a former Maoist commander, won the Lok Sabha elections from Palamu while serving a prison term in Bihar. He had commandeered the Koel-Sankh zone of the CPI (Maoist) along the Jharkhand-Chhattisgarh border. He won after defeating political heavyweights like the Rashtriya Janata Dal’s Ghuran Ram. After being elected to Parliament, Mr. Baitha spent another two years and 7 months in jail, getting bail only towards the end of 2011. Last month, Mr. Baitha switched from the Jharkhand Mukti Morcha to the Trinamool Congress after it became known that the RJD and its ruling coalition partners, the JMM and the Congress would field a common candidate. The constituency is reserved for Scheduled Caste candidates. Among Mr. Baitha’s rivals this time is former chief of the Jharkhand police, Vishnu Dayal Ram, who is known for his term as Superintendent of Police in Bihar’s Bhagalpur when the infamous jail blinding incident took place there. Mr. Baitha arrives dressed in a white kurta-pajama. He makes a brisk round of the market and shakes hands with shopkeepers and customers. He is stocky, with matted hair and a bushy moustache. 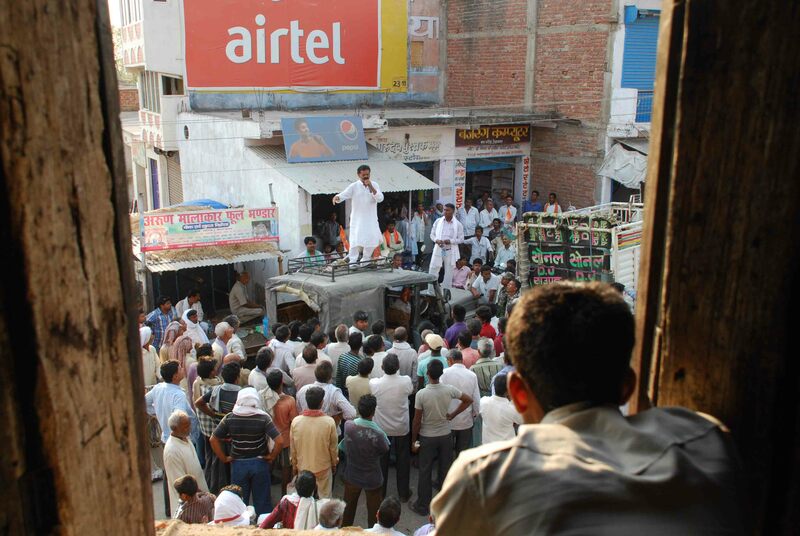 Climbing atop a jeep, he then goes on to address a gathering. end it,” says Baitha, as a crowd of men listens intently, while a few women watch from afar. “By electing me, you made a social revolution possible. But I ask for your vote again to make an economic revolution this time,” he concludes, offering sattu (gram flour) water to those gathered. Back in his white SUV, Mr. Baitha explains what he means by an economic revolution. “Palamu is an agricultural area. For the poor people’s lives to improve, the farmers need more watershed projects to irrigate their fields. Palamu’s farmers need effective land redistribution,” he says. Mr. Baitha’s nephew Mukesh Baitha sits at the back of his car, armed with a gun. 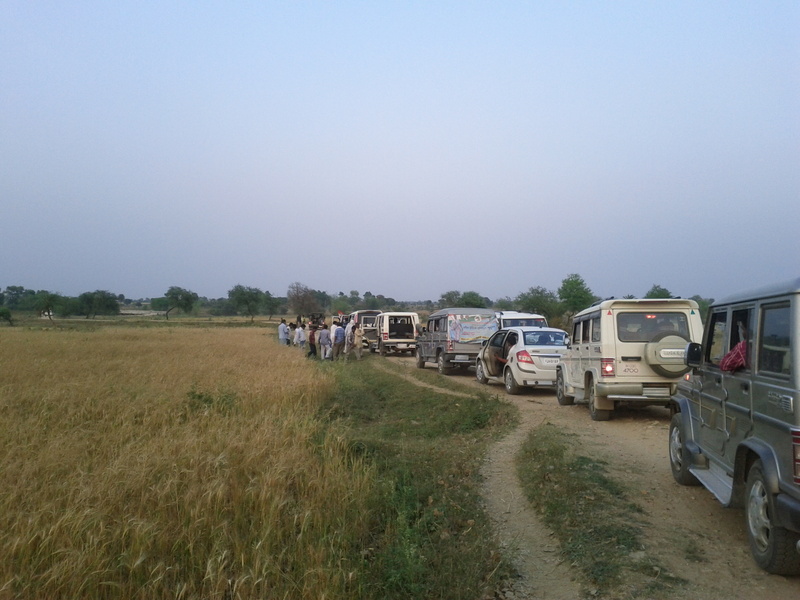 A jeep full of armed police personnel is at the head of his ten-car cavalcade passing through the broken road winding through wheat fields. In Palamu, as in entire Bihar, feudalism and the subsequent marginalisation of the lower castes, who were also landless, created a fertile ground for unrest. During the 70s, many low-caste tillers who got no relief from land reform movements joined the Maoists. Mr. Baitha, born in a mine worker’s family in a village in undivided Bihar’s Bishrampur, recollects he had joined the Maoist group Party Unity in the late 1980s after the Arwal massacre in which 21 supporters of the left-wing Mazdoor Kisan Sangharsh Samiti (MKSS) were killed in police firing. From the 1990s until now, Palamu has repeatedly figured among India’s poorest districts. Splinter groups such as Tritiya Sammelan Prastuti Committee have prolifered here since the early 2000s, which Maoists allege receive police aid. In this complex milieu came Kameshwar Baitha’s unprecedented win of 2009. At Gayabheega tola, there are several concrete houses but people from the Ravidas SC community live in thatched huts outside the main village. An old woman in a red sari, Sarda Devi, scolds Mr. Baitha for having failed to ensure that she received her widow pension. Mr. Baitha chats with her and her family and asks them to allow him to screen a CD inside their house. “This CD has recordings of the 258 questions I raised in Parliament on the Japla cement factory near here, on minerals use, on inflation,” he says as the group watches a recording of him taking oath in Parliament. Many youngsters here have migrated to cities in search of livelihood. But several families still depend on the National Rural Employment Guarantee Scheme that they say is riddled with corruption. “You have been our old leader since the time we were young, but see what you can do for our livelihood,” the villagers tell Mr. Baitha as they affectionately bid him farewell in the night. In the neighbouring Chatra constituency, former Maoist commander Ranjan Yadav is fighting on a Samajwadi Party ticket. In 2009, while serving a prison term, Mr. Yadav had unsuccessfully contested the Lok Sabha elections on a Communist Party of India (Marxist-Leninist) ticket. Later he joined the RJD and tried lobbying with the party supremo Lalu Prasad while the latter was in Ranchi jail after being convicted in the fodder scam. After the RJD gave up the claim to field a candidate from Chatra, allowing its coalition partner Congress to field Dheeraj Sahu, Mr. Yadav switched to the SP. The constituency consists of the tribal-dominated forested Latehar district and the plains region of Chatra that has a significant population of Scheduled Castes and backward castes. “In Mahuadan in Latehar, and in many parts of Chatra, there is no electricity even after 60 years of independence. Big corporations mine coal and iron ore but children in villages cannot even attend a good school. These are issues I want to raise through politics,” says Mr. Yadav in a white dhoti in his sparsely furnished house, still under construction in Namkum on the Ranchi border. Since Ranjan Yadav joined mainstream politics, the CPI (Maoist) has issued public statements dubbing him as a traitor. Last September, the local CPI (Maoist) leader Sudhir issued a six-page statement against Mr. Yadav and two others — Yugal Pal, a former member of the Maoist’s zonal committee who had announced that he plans to join the All Jharkhand Students Union and former sub-zonal commander Vinod Sharma — saying anyone supporting their candidature will be tried by a jan adalat (people’s court). Mr. Yadav says he fears for his life after the fatwa which he finds unjust. Yugal Pal has since withdrawn his announcement. 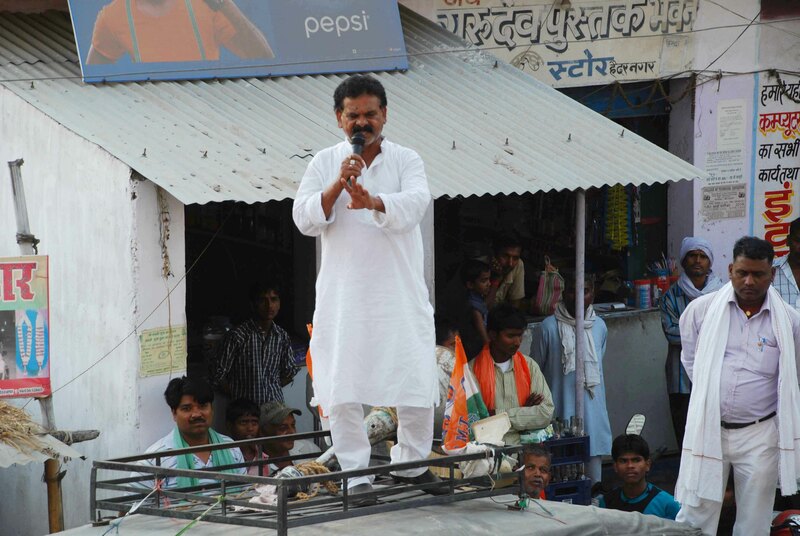 Mr. Yadav recounts he had joined the Party Unity in 1990 at the age of 23 while working as a petty contractor in Palamu. “The party did a lot of good work for ordinary villagers — building checkdams, schools in Garhwa. During marriages, we would distribute utensils. But I have stopped believing we will come to power through an armed revolution,” he says. The Maoists have accused Mr. Yadav of collaborating with the police in paramilitary operations against the Maoists. He refutes the allegations. “The CPI (Maoist) have lost their hold in Chatra because of the Tritiya Sammelan Prastuti Committee. The police is exploiting cracks within the party by supporting such splinter groups,” he said referring to a Maoist splinter group formed in early 2000s by Brajesh Ghanju citing that Ghanju dalits were not treated on par with the Yadav who then dominated the top posts then. “I have not asked for TSPC for their support but I have told them not to disturb my workers and that we won’t disturb theirs,” said Mr. Yadav of his relationship with the TSPC.